It isn’t too often I find myself getting lost in a game’s world, taking it in for what it is and not finding myself nitpicking all the minor points about in-game economies, graphical inconsistencies, and plot holes both large and small. So when I got a chance to play a game based on a Cartoon Network animated show and found myself fully invested in the goings on of the game, I knew I was on to something major. At first I assumed it would just be another quick cash-grab to pounce on the success of Cartoon Network’s best show in years. That’s when the fanboy in me got curious. I read into it and found a surprising number of things that caught my attention. Firstly, it’s a rather traditional RPG with pseudo turn-based and real-time elements mixed together. Secondly, it has the 2.5D aesthetic like you would find in the Paper Mario games with a 3D world made out of flat, 2D sprites. Third, and most important, it had a story written by Steven Universe’s creator and executive producer, Rebecca Sugar. Most movie or TV show tie-ins will get the blessing of the creators and may even pay out the extra money to get the stars to reprise their roles, but the best ones (like a certain other RPG based on a cartoon that may or may not be a mainstay of Comedy Central) will get the shows writers involved in a major way to help make the game feel as authentic as possible. Save the Light hits it out of the park in that sense, with the player genuinely feeling like they’re playing an epic, fifteen-plus hour episode of the show with the entire main voice cast driving the point home. Intrigued, I bought the discounted game, and was almost instantly blown away at how not cynical the game was. From the opening cutscene with full voice acting from the Steven Universe cast to the first major boss fight, I don’t think the smile on my face ever went away. The characters were written like they are on the show, the dialogue between characters was written in similar style to that of the show, and the semi-regular fourth wall breaks acted as a subtle nod to both avid viewers of the show, and frequent RPG players who are so used to seeing all the normal tropes and mechanics that Save the Lightunapologetically employs. The game knows what it is and is self-aware of how ridiculous it can get at times, to the point of making fun of Lapis and Lion for wanting nothing to do with the quest itself as a way to not go overboard with the character roster while also making sure the right characters were excluded for the right reasons; Lion just wants to nap and Lapis is NOT the adventurous type, so she is content to let Peridot run off with the Crystal Gems on their quest without her. The game also knows that most players would just assume that four-person party everyone would use would likely consist of “Garnet, Amethyst and Pearl AND STEVEN” as the show’s theme song would say, but actively makes sure that all of the seven playable characters get their time to shine. Each character in battle after building up a bond with an ally, can perform a combo attack with the bonded character, leading to massive damage, or massive buffs for one character or the whole team. Even some puzzles can be solved only with specific characters, like Peridot’s ability to move metal, Greg’s ability to solve musical puzzles with his guitar playing wizardry, and Connie’s ability to cut through grass with Rose’s sword to find hidden items. This attention paid to what many would deem the “minor” characters kept me interested because those “minor” characters are among my favorites in the cast and giving them a purpose outside of window-dressing and fan service showed that Sugar and the devs at Grumpyface Studios care about the game and the universe and aren’t interested in a quick profit. 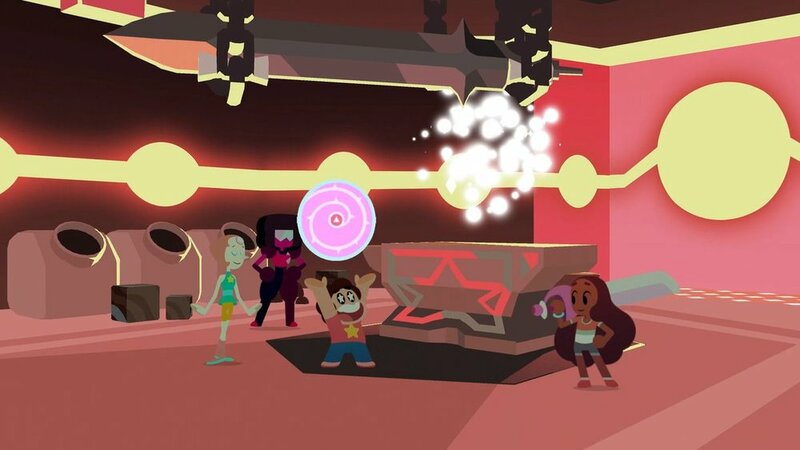 While a relatively minor touch, it really did a lot to keep me invested in the game as the developers could very easily have just buried Peridot, Connie, and Greg in the depths of irrelevancy for the sake of focusing on the main quartet, which would have ruined much of the experience since the show is built on the backs of its characters and how they interact with each other. They didn’t do it, and the game was improved because of it. Despite all of this, I had no intention of playing this game as long as I did prior to writing this. Hell, I didn’t even think I would be in this position when I picked the game up, I just wanted a distraction from the daily grind. Next thing I knew, Friday became Sunday and Save the Light was the only thing I had on my mind. I knew this experience was something I had to write about, so here I am. But why? Why did a $20 indie release based on a Cartoon Network show end up being such a huge time sink for me? If it was just a no-name RPG I wouldn’t have paid it any mind, if it was a Steven Universe game in any other genre, I likely would have passed over it. Even with those two elements combined, something about this game had to have drawn me in on more than just a fanboy level. Inevitably, it comes down to heart. As corny as it sounds, the game was created with the heart of the show in mind. This doesn’t feel like a product, hastily rushed to market by the executives at Cartoon Network to make a quick buck. It feels like Rebecca Sugar wanted this game to succeed and stand on its own, not just be virtual Steven merchandise to be disposed of when the final boss is conquered. If you’re a fan of the show and have a PlayStation 4 or Xbox One, you should consider buying this game. Most bugs and glitches that have been mentioned in reviews at launch have, as far as I could tell, been patched up so the gameplay experience should be neato burrito. Just make sure you keep track of time or else you’ll end up like me and lose 20 hours of your life and not even realize it.